While our site is currently under construction, please follow the instructions below to inquire about submitting an application. Click here for instructions to log on to our Foundation’s online portal. Once in the portal, complete and submit a Letter of Inquiry form. 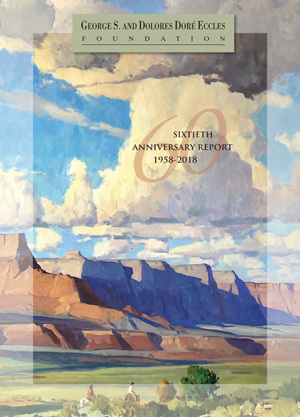 The Foundation recently released its 60th Anniversary Report celebrating the anniversary of our founding in 1958 and the impact of our partnerships with statewide nonprofits to benefit the people of Utah. Painting Credit: Fresh Air on the Vermilions by G. Russell Case, 2012; oil on canvas, 48" x 60"